JAKARTA - A 10-gold bonanza across five sports on Friday took Japan’s tally to 69 gold medals, more than at any Asian Games since the last time it topped the medal table in Bangkok in 1978. Japan’s sailors provided four gold and its judoka three, while the women’s soccer team defeated China for the title. Yuko Takahashi won the women’s triathlon and the women’s field hockey team shocked India in the final. With just one full day of competition remaining in Indonesia, Japan has wrapped up second on the medal table and has added 50 silver and 70 bronze to its gold-medal haul. According to sports-data analyst Gracenote Sports, of the big-three Asian nations — China, South Korea and Japan — only the latter has maintained its relative share of total medals compared to four years ago, at around 13 percent. China and South Korea have both seen significant declines. Japan’s sailing crew delivered on the sport’s final day. The men’s 470 pair of Tetsuya Isozaki and Akira Takayanagi won seven of their 12 races to claim gold, and the 49er duo of Shingen Furuya and Shinji Hachiyama proved consistency was key in winning their event. Women’s laser radial competitor Manami Doi dominated her event, winning nine races, and 470 sailors Ai Yoshida and Miho Yoshioka did the same in theirs, triumphing in 10 of 12. Ruika Sato began what would be a very successful night for Japan in judo. Sato beat a South Korean opponent by ippon in the women’s 78-kg event, as did Kentaro Iida in the men’s under-100 kg division. “There are still more challenges, but winning here has given me great confidence,” said Iida, who at age 20 became the youngest-ever gold medalist in his event at an Asian Games. Reigning world women’s over-78-kg title holder Akira Sone won Japan’s final judo gold on Friday as favorites Mashu Baker and Takeshi Ojitani both fell, the former taking bronze and the latter unable to claim a medal. “I was only aiming for the gold medal, so I feel very frustrated,” said Rio Olympic champion Baker, who revealed he has been battling a shoulder injury suffered during training camp three weeks ago. 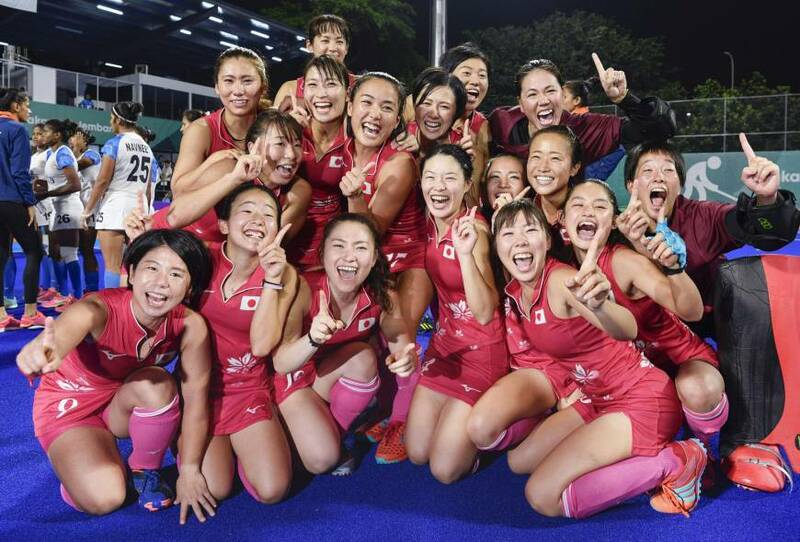 In one of the bigger shock results of the Asian Games, the Japan women’s hockey team beat powerhouse India 2-1 in the gold-medal match. Minami Shimizu scored the opener from a penalty corner in the 10th minute, and after the Indians equalized in the second period, it came down to Motomi Kawamura to score the winner just before the close of the third. Yudai Nitta claimed track cycling silver in the keirin, and the men’s madison team delivered a bronze. There were also bronze medals collected in squash and boxing. In team sports, the Japan men’s water polo squad defeated Iran 18-7 to reach the final where Kazakhstan awaits, and the men’s quadrant sepak takraw team had an unlikely 2-0 win over Vietnam to book a place in the final against Indonesia. After losing the first super-round match against South Korea on Thursday, the Japan baseball squad downed Taiwan 5-0 on Friday. South Korea also won, beating China 10-1, meaning that Japan was to face South Korea, but this time for gold on Saturday. Elsewhere Saturday, Jumpei Furuya won the men’s triathlon, giving Japan its second individual triathlon gold medal in as many days.